Have you ever considered investing in different incoming phone numbers to cue what happens next for the customer? For example, if you run a car rental company, you could offer one number for regular use customers and one number for your premium or repeat customers. Team members responsible for answering these inbound calls would have different prompts and scripts depending on the number dialed. Additional incoming phone numbers, with area codes based in your prime geographic targets, can give the impression of a local presence even if your main hub of operation is based in another state. This might be enough to give your company a strategic advantage with potential customers considering your organization for their next purchase. You can also provide very different user experience by the way you set up your auto attendant options. Incoming calls with new leads could be routed to your team mates best prepared to answer questions regarding signing up or ordering your product or service. Existing customers could be given another phone number entirely or directed differently via the auto attendant on your main line. This could trigger different service prompts such as the ability to reach tech support or upgrade account features. Call filtering could also be used by your organization to provide callers with different experiences throughout the day. For example, you can set the features on your auto attendant to handle callers differently depending if they are calling during normal office hours, off-hours, holidays, and/or emergency situations. Different customer experiences might also be desirable if your company has a store in some states but not others. By segmenting your callers into these two groups, callers could either be directed to customer service agents ready to handle questions regarding your physical location or be directed toward your online presence, for example. 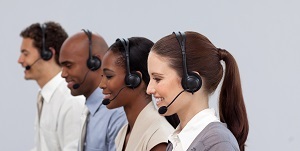 With a bit of preplanning, different inbound phone lines and auto attendant paths can elevate your customer service levels and provide the right information quickly. Anticipating the needs of your callers can help your business establish a competitive edge and build a loyal customer base!